NASA FIRES MANAGER FOR NOT DESTROYING PHOTOS. NASA Dismisses Former Apollo Photo and Data Manager from JPL Educational Program Missing Apollo Data to be Shown at National Press Club in Washington D.C. Johnston is a key participant in the upcoming October 30th, 2007 Enterprise Mission press briefing at the National Press Club in Washington, DC (Zenger Room, 9:00 AM). At that time, Johnston will reveal how NASA ordered him to destroy key Apollo lunar images and data more than 40 years ago, rather than allow them to be preserved for academic and public study. Johnston will testify how he disobeyed these NASA orders, secretly preserving the critical Apollo images — and the never-officially-published lunar discoveries recorded on them. 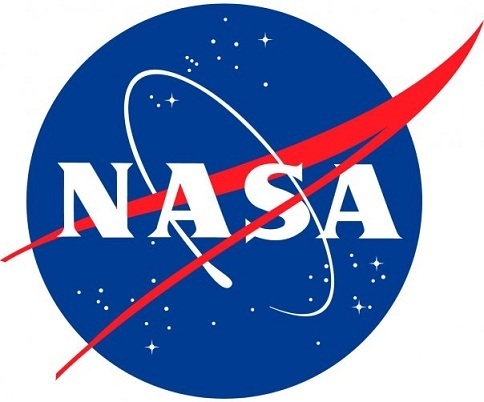 According to AP, NASA is currently embroiled in a similar controversy with Congress because of the agency’s planned destruction of supporting data from a recent aviation safety study. This photograph was taken in the Karze, eastern region of Tibet. A group of friends were on their way to a nearby airport when the car they were traveling in started having engine problems. The group got out to move the car off the road when one of the group spotted a UFO hovering overhead and managed to take a photograph of it. 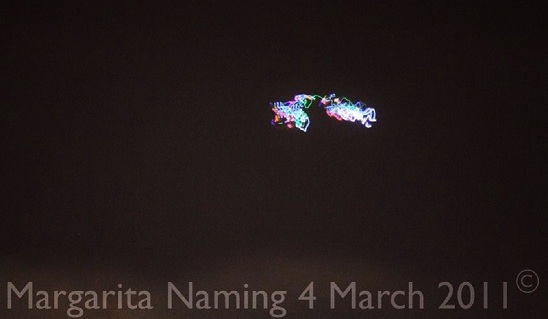 This UFO event occurred on February 20 of this year. 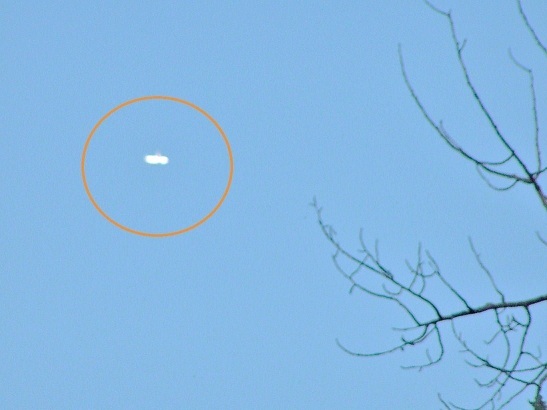 The UFO seen in the photo is a classic, metallic flying saucer. The witnesses have submitted the photo to researchers for analysis. 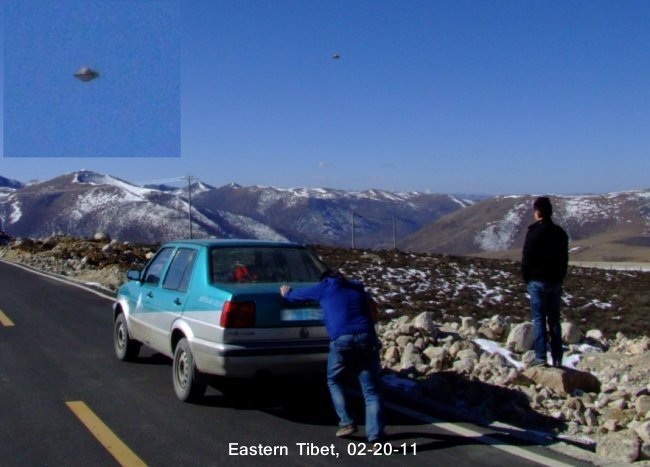 Tibet has had an association with UFOs that might well go back thousands of years. It is also believed that a giant UFO is buried somewhere under mountains in the region. In the 10th century AD, Tibetan monks adorned pages of sacred Buddhist manuscripts with depictions of metallic flying saucers they had seen in the skies above the area. 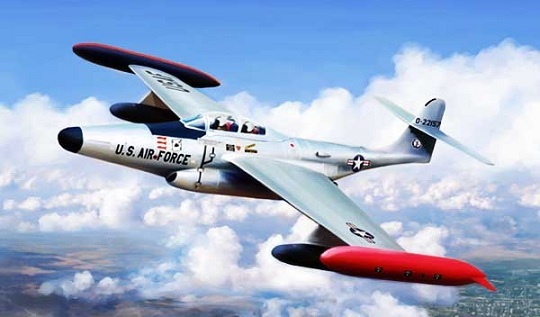 On the evening of November 23, 1953, an Air Force radar controller was alerted to an “unidentified target” over Lake Superior, and an F-89C Scorpion jet was scrambled from Kinross AFB. Radar controllers watched as the F-89 closed in on the UFO, and then sat stunned in amazement as the two blips merged on the screen, and the UFO left. The F-89 and it’s two man crew, pilot Felix Moncla and radar operator Robert Wilson, were never found, even after a thorough search of the area. Incident: The channel that connects Lake Superior with the other Great Lakes flows through the Soo Locks near Saulte Ste. Marie, Michigan. On one side of the channel is the U.S., and on the other side is Canada. The fact that this area is on a U.S. national border makes it a restricted airspace. As such, it was monitored by the Air Defense Command in 1953. On the evening of 23 November 1953, an Air Defense Command Ground Intercept radar controller at Truax AFB became alerted to an “unidentified target” over Soo Locks. He sounded the alert, and an F-89C Scorpion jet was scrambled from nearby Kinross Field. The jet was piloted by 1st Lieutenant Felix Moncla, Jr., with 2nd Lieutenant Robert Wilson in the rear seat as radar operator. That didn’t happen. Suddenly, the single blip flashed off the screen and the radar screen was clear of any return at all. Officials at Norton Air Force Base Flying Safety Division issued a statement that “the pilot probably suffered from vertigo and crashed into the lake.” However, this was merely speculation and was based on hearsay reports that Moncla was prone to vertigo. Off the record, those that were present in the Ground Control radar room that day have expressed other opinions. They think that whatever the F-89 was chasing directly caused the disappearance of the jet. – Loy Lawhon, About.com Thanks to Phantoms and Monsters. I am submitting this on behalf of a co-worker. She was on a farm near Toefield, Alberta and had decided to walk into the pasture to find her horse. She had her camera with her. She noticed a donut shaped object, brilliantly lit up, hovering over the pasture. She remembers that it may have had a dome on top. After watching it for a while, just hovering and not moving she took a picture of it. She was not afraid as at the time as she was wondering what it could be. It was not until after the event that she realized it was a ufo. She looked at the camera to see if it captured an image and indeed it did. Picture attached. When she looked up to take another photo the object had disapeared. This case was reported to MUFON. 3-19-11 …. STRANGE OBJECT OVER LOUISIANA. I am a photographer, and on March 19th I was outside taking pictures of the moon during its lunar perigee. My grandparents were also outside with me, playing with my daughter on her swing set. While aiming my shot of the moon I noticed what I thought was some debris on my lens, so I cleaned it and prepared to try the shot again. I observed at this point that I could make out the object only through the camera lens, and that it was not obvious to the naked eye. At that point I realized that I was not seeing a spec on my lens but rather something in the sky. I tried to use my auto focus to capture the object, but it kept focusing on the moon. I turned off the auto focus and manually targeted the object: this is the picture that is attached to this report. I don’t know if it is important, but my camera is a Canon Rebel T2i with a Sigma 18-250 mm lens; the photograph was taken zoomed all the way in. Once the image was captured, I reviewed it on my camera and called my grandparents over to see what I had photographed. None of us had ever seen an airplane like this before. My grandparents and I both looked up but none of us could see the object. I set my camera to “live mode” (allowing us to see the viewfinder’s image on the screen on the back of the camera), positioned it, and we all saw the object. I’m not sure if we couldn’t see the object with the naked eye because of its size in the sky or something else, but whatever the case we could only see it through the camera. While I never actually saw the object moving, it was in slightly different positions to the moon every time I looked at it. We talked about it for a couple of minutes and I tried to get another picture of the object (I couldn’t find it this time) and we decided to come upload the images to the computer to look at them a little closer. Thanks to MUFON case files. Moreover, a rare air defense video from Japan shows a new UFO flying over the nuclear-powered aircraft carrier USS Ronald Regan early Monday morning, as the carrier and accompanying guided-missile cruiser and destroyer ships arrived off Japan’s coast to help with disaster response. NOTE: The above photo is a rendering. On being further questioned by Mr Marek Novak, a delegate from Poland as to whether the pyramid might still contain alien technology or even a UFO with its structure, Dr Shaheen, was vague and replied “I can not confirm or deny this, but there is something inside the pyramid that is “not of this world”. Delegates to the conference on ancient Egyptian architecture were left shocked, however Dr Shaheen had refused to comment further or elaborate on his UFO and alien related statements. 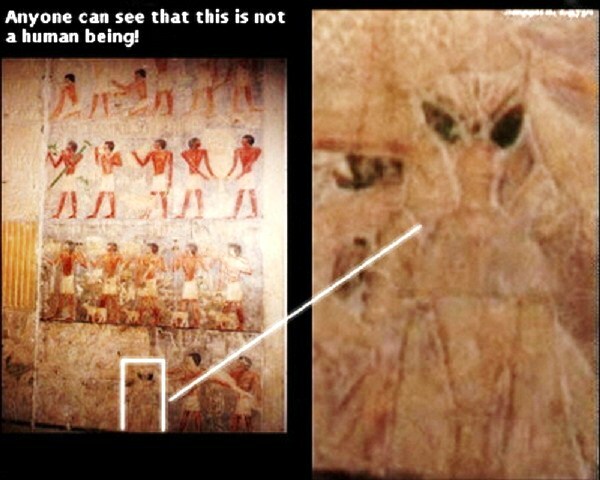 The Secret KGB UFO Files documentary, that’s deals with the fact that Russian had already discovered the tomb of Alien Humanoid in Egypt and something is beneath the pyramid. The Secret KGB UFO Files documentary interestingly supporting the head of the Cairo University Archaeology Department, Dr Ala Shaheen claim as well. 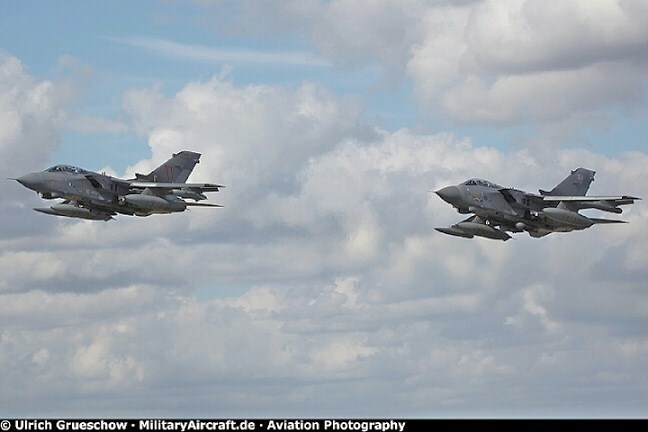 The crew were returning from a ”low level” mission in the UK to RAF Laarbruch in Germany when they were flying through Dutch airspace over the North Sea. Without warning the UFO – as big as a C130 Hercules plane – appeared and they had ”never seen anything like it”. In written answers about the incident the pilot said: ”I did not lock the UFO on radar. My navigator and I were so surprised we did not think to do so. ”Indeed, for the majority of the sighting, the UFO was out to one side of my aircraft which would have required me to manoeuvre the aircraft to place within the radar field of view. ”Of more interest, despite repeated radio calls to Dutch Military Radar, the controller insisted that he could not see the UFO. BOTH ME AND MY WIFE DIANE WAS SITTING WATCHING THE T.V WHEN A ROAR CAME OVER OUR HOUSE. I HAVE SEEN AND HEARD THIS UFO ON 2 OTHER OCCASIONS, SO I HAD AN IDEA THAT THE SOUND WAS NOT OF JETS. BOTH ME AND MY WIFE LOOKED AT EACH OTHER AND I QUICKLY WENT OUT TO THE FRONT OF THE HOUSE. 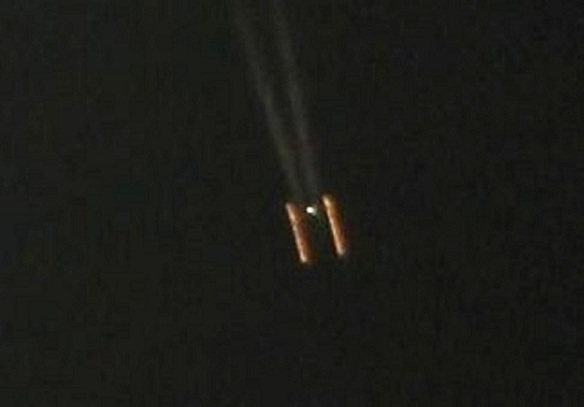 I SAW 4 RED OBJECTS, APPROX 1 MILE HIGH, GOING OVER VERY FAST AND I WAS ONLY ABLE TO CAPTURE A PHOTO OF THE LAST 2 AT 1000TH SEC CAMERA SPEED, AS I USE THIS ON ALL OBJECTS. THIS WAS OUR FIRST OF THE NIGHT. BETWEEN THE TIMES OF 7.00pm AND 9.45pm A FEW OTHERS THAT HAD SINGLE LIGHTS HAD ALSO PASSED OVER OUR AREA. I WAS UNABLE TO CAPTURE THESE BECAUSE THEY WERE TO HIGH. At 9.45, WHILE I WAS BACK OUTSIDE IN OUR REAR GARDEN, SUDDENLY A LARGE SINGLE LIGHT WAS PASSING FROM THE WEST TO EAST. MY DAUGHTER EMMA ALSO CAME OUT TO THE GARDEN AT THIS TIME. THE UFO WAS CHANGING COLOUR FROM WHITE TO RED. THE SPEED APPROX 100/200MPH AND THE SIZE WAS APPROX 15/20 METERS. MY PHOTO SHOWS 2 DIFFERENT COLORS AS YOU CAN SEE. I AM IN A UFO HOT SPOT AND I HAVE SEEN MANY WITHIN THE LAST 12 MONTHS. 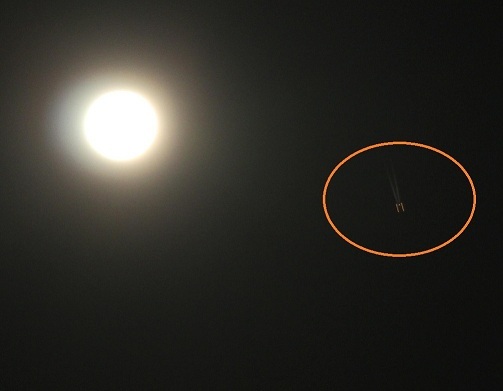 I RESEARCH FOR “WORLD UFO PHOTO’S” SO I DO KNOW WHAT TO LOOK FOR. On 09-18-2010 at around 20:30 I was in the backyard grilling when I noticed an orange orb in the sky. I went to get my wife who was in the house preparing the remainder of our dinner. She and her brother came outside with our son and we then called her uncle who on the second story of the house in his room with his girlfriend. My wife’s father had just come back in the house from the alley where his cousin was still working in the garage. There were 8 of us total who, within about 1 minute from the first time I seen the object, were witnessing this strange phenomena for about 20 minutes. When we first saw the object we all began to wonder at what it might be. We immediately knew that it was not any type of normal aircraft as we all have served in the military and are very familiar with aircraft and air travel. As we paid close attention the orb it seemed to understand that we were interested in it and that it was noticed by us. At this point it begin to descend upon us and it’s shape begin to be more recognizable. Once we all noticed the same features and talked about it for about 2-3 minutes, we begin to notice that it was traveling with several other orbs which were not the same in color but were the same in shape and form, as well as motion. This continued for about 10 more minutes. After this, the orb begin to make slow broad sweeping motions across the sky staying at approximately the same altitude at which time we saw 2 star-like projectiles issue out of the western side of the orb, as we were facing towards the north. We continued to observe this orb for about 10 more minutes after which time it moved higher in altitude and off to the North West at a steady pace dimming, brightening, dimming, brightening until it passed from view into the night sky only to return later on. When the orb had faded from view we all went into the house that we might see what pictures and video we had gleaned from our encounter with the object that had shown itself to us. After about 25 minutes of looking at these pictures I looked at the front door because I felt a warmth coming from it. I heard a voice in my spirit that said, “They’re back out here.” I didn’t pay close attention and looked away only to feel the warmth again and look back at the door when I heard the same thing in my spirit: “They’re back out here.” This time I ran out the front door because I knew that I was hearing from a power greater than myself that I needed to witness this event again. (Just so you know I was a skeptic before this and told [GOD] that He would have to prove these things to me if they were in fact true.) He in fact did just that. After seeing the objects from the front of the house we all ran back to backyard where we saw the orange orb with its’ friends for about 7-10 more minutes before it left in the same manner as before. There were 8 of us that saw this at the same time in the same place. 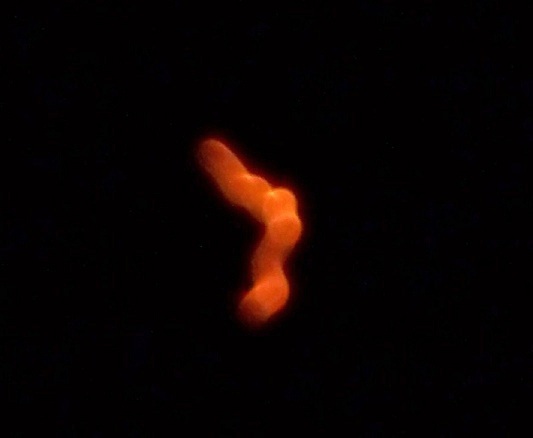 This was a very exciting time for all of us and I believe that it was it meant to happen that we might all witness creation that we are not yet well acquainted with. . .
An award-winning NASA scientist, Richard B. Hoover, Astrobiology Group Leader at NASA’s Marshall Space Flight Center, claims that he found tiny fossils of alien life in the remnants of a meteorite has stirred both excitement and skepticism in the world astrobiology community, and is being closely reviewed by 100 experts. Hoover claims to have found fossilized bacteria that appear similar to bacteria found on earth – like Titanospirillum velox, below from meteorites known as CI1 carbonaceous chondrites – of which only nine are known to exist on earth. Hoover has analyzed meteorites and microbial extremophiles from Antarctica; novel bacteria from the glaciers and permafrost of Antarctica, Patagonia, Siberia and Alaska, and from haloalkaline lakes, geysers and volcanoes of California, Alaska, Crete and Hawaii. 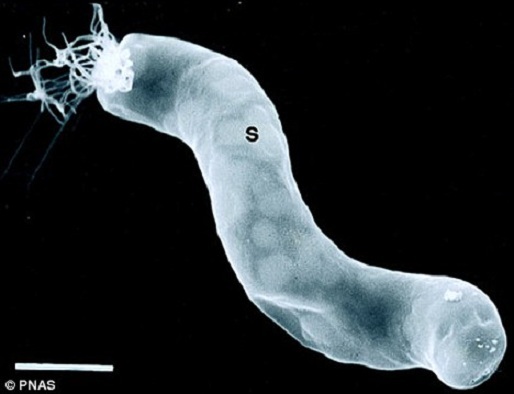 He has also discovered three new species of bacteria from Mono Lake in California — Spirochaeta americana, Desulfonatronum thiodismutans and Tindallia californiensis — and another, Carnobacterium pleistocenium, which survived for 32,000 years in a frozen Alaskan pond. In early May of 1969, I was on active duty at Great Lakes Naval Station in Illinois. I had been “lucky” enough to be assigned sentry duty at my barracks from 24:00 to 04:00 (12:00 am to 4:00 am). My post was the 3rd floor balcony on the end of one of the many identical barracks buildings in that sector. All of the buildings were exactly the same: 3 stories tall, about 30 feet wide, and 150 feet in length. The long sides of these buildings faced each other, and between them were “alleys” about 30 to 35 feet wide, for facilitation of vehicle traffic, if need be. The night was very clear and cool, and I was grateful there was no wind. I was anxious for my duty to be over, and kept glancing at my watch to hurry the passage of time. This is what I was doing at exactly 03:11, when the silence of the night was shattered by the cry of “INCOMING!” from the sentry on the building to my left. I swear I jumped about a foot! I took my eyes from the watch face, and saw him pointing frantically up at the sky at an angle of about 45 degrees above the horizon directly away from our position on the end of the buildings. Then I saw what he meant. There, falling from the sky, making a noise that sounded like a loose sail flapping in a high wind, was a flaming orange ball of fire! And worst of all, it was headed directly at US! At least it was going to be a quick death, because it was upon us in less than 3 seconds. I just stood there with my jaw dropped, and waited for the impact that was certain to come. But it never did! At the height of about 10 feet above the ground, exactly half-way between the other sentry and I, it JUST STOPPED DEAD! I thought “This must be what they mean when they say your whole life passes before your eyes just before you die.” But my life didn’t pass before my eyes. I was standing there looking down at the molten, boiling surface of a totally silent sphere approximately 18 to 20 feet in diameter, and it was beginning to move. It is important to note that I felt no heat from the object at any time, and I could ascertain no “hot” smell whatsoever. It didn’t start with a jerk, but smoothly picked up speed from a standstill until it was moving at the rate of about 5 feet per second on a perfectly horizontal flight- path between the barracks I was on, and the one on my left where the other sentry stood guard. It didn’t spin or rotate as it passed by me. The top of the sphere was about waist-high and at a distance of less than 25 feet at its closest point. It continued on this path until I could no longer see it, as the balcony wasn’t as wide as the building I was standing on. I did, however, continue to watch the glow from it reflect between the buildings for several more seconds, until it slowly dimmed into nothingness. I never saw it ascend, but, as I explained, the building blocked my view. When it was gone I checked the time: 03:11 and 40 seconds. Being only 17 at the time, I went along with his advise. I think it’s time I told someone, so here it is. I can still see the fireball when I close my eyes. I thought I would never see anything like it again in my life, but I was wrong! Over 30 years later, just by chance, my brother asked me to give him my opinion on something strange that was on a video tape one of his customers had mailed him. My brother is a master gunsmith, and the customer had sent him scenes shot at a “machine gun shoot” in Alabama. My blood ran cold as the image came into focus. It still runs cold as I remember it, now. There, hovering about 75 feet over the crowd, was the TWIN TO MY FIREBALL! I am still trying to obtain the footage from him, but to no avail as yet. It all happened when we were arriving home around 9.30pm and my youngest son, Manuel was crying. So his daddy, Nolan diverted his attention to colourful lights in the sky, asking him to look at the aeroplane. When he stared longer he said it the lights do not look like aeroplane. As we watched, the object has flickering lights with blue, green, white, red and the object was seen hovering. At first we thought that it was a helicopter. Then we took out our binoculars and digital camera. Viewing with the binoculars, the lights were colourful, blue, red, green and white and the object was hovering. Nolan says it changes shape when he viewed through the binoculars. Then I took a few pictures with my digital camera. As I did not have my tripod and it was dark and my zoom lens was only 80-200mm, the image was not sharp. I wanted to take some video shots but was not in time as the object started to drift further and suddenly it disappeared. The incident of the object hovering with fantastic colourful lights happened for around 20 mins. Thanks to MUFON’s case file. I started seeing weird objects in the sky in the corner of my eye for about the months of may 5 till the night of the incident and I would always see these objects and most of the time when I looked at them they would disappear within 3 seconds a couple of times one second but I never thought to much of it at the time and during the nights is when it got creepy since I would some lights in the mountains that would get close enough for me to be able to tell what the shape of the UFO is for about 2 seconds before completely disappearing. I think the size of the UFO was about 300 – 350 feet long and I’m not really sure how thick it was but this accounts for all the times I have seen the ufo before having this dream or whatever it was. The Movement patterns of the UFO always flew from such a distance it was the size of the end of a pin to about 500 feet away and when it reached that point every time it would just stop hover (I always got the feeling of being watched when it stopped) and then 3-5 seconds later it would fly off. And this would happen most of the time on a clear night sometimes during a darker cloudy day but always within those conditions, the hight of the UFO was about 300 – 500 feet in the air and was at least 1000 feet or more away and it was always the same shape, a triangular shape with a slight curve to the top of it and it was silver in color. Now I’m not sure of the dates of when I have seen them but I have see them 6 times during the month of may starting at the 5th and 7 times during June starting on the 1st. Every night that happened I got scared and would stay up for hours with my pets in my room so I knew if they would be coming since I thought that well my dogs would get scared first before something happens and I would have at least some kind of warning. Now on to the dream, The night started like every other night and i had seen the UFO the one and only time on the night of the 15th of July i went 2 sleep around 11:30 and then the dream started well what seemed like a dream at least but anyway, The dream started out where i remember being in my room laying down on my bed watching Tv when suddenly the cable shut of and i got the blue screen of no signal and 3 seconds of that and it shut off and my room was suddenly plunged into pitch black and i got up and tried to turn on my light but it would not work there was no power at all and when i tried to open the door to go check the fuse i had no strength in my legs to move and i could not lift my arms or hands in anyway to open the door yet i was in a calm state so i just went back to bed and what felt like 5 mins of lying there i suddenly felt like i was not alone in my room (by the way my room layout is my bed is under my window but takes up the space between the chimney in the middle of the room and the wall towards my bed on the other side of that chimney in the north east corner that was blocked by vision by chimney) and i had this feeling that i was not alone and well i didn’t really want to see it and im glad that it was pitch black cuz in my head i have always told my self that if they want to abduct me that they would at least do it in a way where i cant see them or they take the appearance if there grays as humans but they at least granted me that one wish so i get the sense that they where not benevolent beings. Anyway the next thing i remember is blacking out and i remember the cold sensation of being on a metal or steel table with extreme bright lights my eyes where taking a very very to adjust and i remember looking to my left and seeing a metal door that slid open and a robe that was being dragged against the ground like something was wearing it and the next thing i new i got the feeling in my head that i should look straight up and so i did when i did i saw to my fright four alien grays looking straight down at me each of there heads positioned at the four lines of my main sight and thats all i remember from my dream. 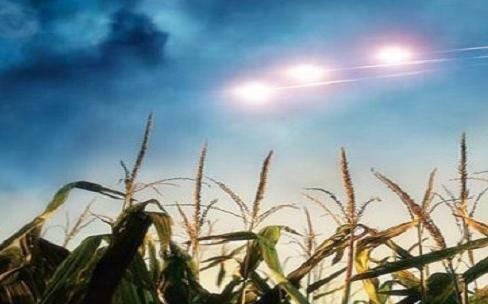 Now for paranormal activity i have not noticed anything UFO/Alien related besides the UFOs before hand and sometimes but not as frequent as before that i do still see them. Sometimes but not all the time do i feel like im being watched sometimes by someone in a Van,Truck, Or Car always seem to be watching me when that happens and its always a white or black vehicle nothing else and i have heard that might be something to do with the men in black im not sure it could be, I also feel that im being watched from the sky and when i go to look nothings there i dont really feel like im being watched at night time more then the day and it happens almost anywhere i am and could happen at anytime. Now as for the symbols i have showed you i did find the part of the episode by UFO Hunters Aired on History Channel http://www.youtube.com/watch?v=OhJuhHlAJ2A&feature=related the symbols are showed right in the middle of the video and the one thing i have and i cant get out of my head is i have a really haunting feeling in my head that i know what it means but its hard for me to get the info out. Now for the special ability’s i have none that i know so far but i do feel like i am able to read symbols that are on anything else or on crafts how i can do that i do not know but i do feel like i can and one day if possible help from someone to bring that out and i am drawn to what i truly feel are real and not faked by man i seem to want to be drawn to the real thing. (Just as i said that i had the hair on my entire stand up and drop in temperature if that means anything). and i have a fear of the dark if im alone and i feel that im being watched but for some reason my fear goes away as soon i turn on a light. i feel like i am being abducted from time to time because i get the feeling sometimes that i have not spent as much time i have in certain area that i am in for example i have only been in my room for 2 hours according to me but to my clock and everyone else i have been gone for 6 hours or more. One time i remember being watched by someone in a black vehicle no licence plate or anything just a plain truck and the next thing i know i look into the sky and see a black triangle object in the distance but close enough that i feel im being watched and most of the time the truck or van drives ofF and the Ufo flys off at incredible speeds. i have not one clue why that is happening but it happens some of the times. 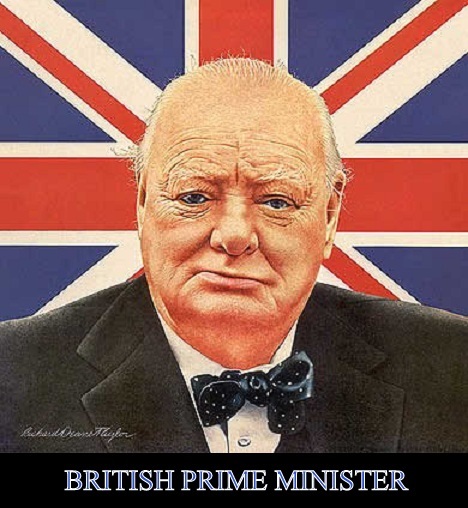 Winston Churchill ordered a cover up of a reported close encounter between an RAF aircraft and a UFO during the Second World War because it would create “mass panic”, accordingly to newly-released files. The claim that the then Prime Minister ordered details of the unexplained incident over the East Coast be kept secret was made by a scientist who said his grandfather was one of Churchill’s bodyguards. The tale is told in newly declassified Ministry of Defence UFO files put online by the National Archives. Allegations of the cover-up emerged when the man, from Leicester, wrote to the Government in 1999 trying to find out more about the incident. The incident allegedly involved an RAF reconnaissance plane returning from a mission in France or Germany towards the end of the war. The wartime leader was in fact the first person to answer a question on the subject in Parliament when, as First Lord of the Admiralty, he was quizzed about an unusual sighting off Sheerness. “It was in 1912 and everyone was getting nervous about the Germans,” said Dr Clarke. Dr Clarke added that many people want to believe in UFOs and, even when the Government discloses what it knows about them, the chances are someone will be crying “conspiracy theory”. “We want to believe in them and that’s why people remain fascinated,” he continued. In the Second World War, for instance, pilots from all sides reported unusual sightings, telling of unaccountable flashes of light and being followed by strange airborne objects. “The Americans used to refer to them as ‘foo fighters’,” he says, “I think after a famous cartoon character and from where, I imagine, the rock band took their name. “The US pilots used to talk about objects that circled them around during their flights, with flashing lights and changes of direction that did not fit in with possible enemy patterns. The British and the Germans also reported such sightings. Thanks to Sky News and The Truth Behind the Scenes. 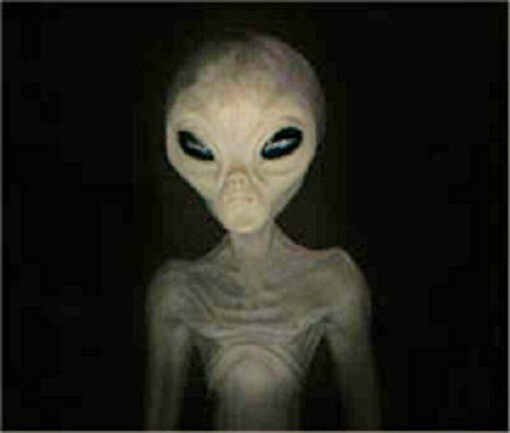 The late Sam Sherman the president of Independent International Pictures writes, “Where do Aliens come from? When interviewed for my still-unreleased film- “Beyond This Earth”. Astronaut Col. Gordon Cooper spoke about one reported instance where: “Aliens were living on their ships, as they had lost their sun in their own solar system”. A possible hypothesis may be that some ET groups live on large ships or space platforms, as has been reported, not on planetary bodies, and these huge crafts loop in and around our planet. Further they send out smaller scout craft for missions (whatever they may be) to Earth. They may have traveled great distances here over decades or hundreds of years and their huge ships serve as replacement and space-faring planets.